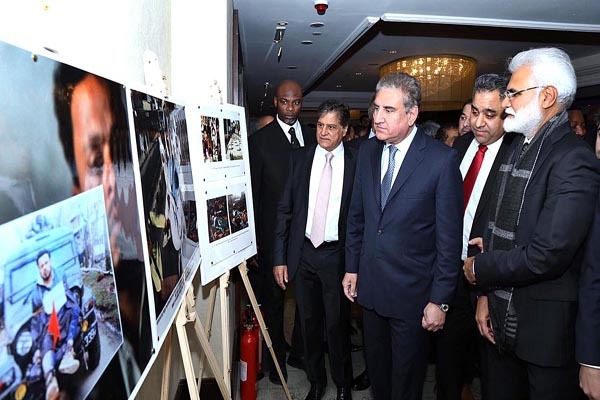 LONDON, Feb 6 (APP):Foreign Minister of Pakistan, Makhdoom Shah Mahmood Qureshi, on Tuesday evening inaugurated an Exhibition on Kashmir marking the observance of Kashmir Solidarity Day in London. British Member Parliament Imran Hussain MP, and Chairperson of World Congress of Overseas Pakistanis (WCOP), Mr.Naheed Randhawa, jointly hosted this exhibition in a show of moral support to the oppressed Kashmiri people in Indian occupied Jammu & Kashmir where grave human rights situation has attracted the world’s attention. Foreign Minister Shah Mehmood Qureshi who is visiting London to participate an International Conference in the British Parliament was the chief guest. The exhibition showcased a wide array of photographs that shed light on the plight of innocent Kashmiris, particularly pellet gun victims including women and children who suffered from injuries at the hands of Indian security forces in IOK. A part of display of Indian atrocities pertained to genocide and dozens of massacres carried out by the Indian occupation forces. A number of Kashmiri artefacts were also on display along with pictures depicting the heavenly landscape and pristine beauty of Jammu & Kashmir. They stood in sharp contrast to the present-day situation where violence continues to inflict suffering upon the people of IOK through use of draconian laws and Indian state sponsored terrorism in complete disregard and violation of the UN and other International Conventions on human rights. On the occasion, a number of documentaries and slide shows pertaining to the people of Jammu and Kashmir’s endless sufferings were also shown to the jam packed venue. The pictorial presentations were reflective of the crimes against humanity committed by Indian state agencies in Indian occupied Jammu and Kashmir. Kashmiri traditional songs were also played during the event. On the occasion, sixty seconds silence was observed by the participants to pay tributes to the struggle for freedom and sacrifices of valiant people of Indian occupied Kashmir (IOK) against the brutal Indian occupation forces. In his remarks as Chief Guest, the Foreign Minister, Shah Mehmood Qureshi while highlighting the prevailing human rights situation in the Indian occupied Jammu and Kashmir, strongly condemned the ongoing atrocities and expressed solidarity with Kashmiris in their struggle for their legitimate right to self determination, as also enshrined in the relevant UN Security Council Resolutions. He assured that the Government and the people of Pakistan remain steadfast in their moral, political and diplomatic support to the Kashmiris. Pakistan Government and its people, he said spare no occasion to create awareness on Jammu & Kashmir with the view to ensuring that bloodshed in Indian Occupied Kashmir is halted immediately and unconditionally and that the perpetrators of crimes against innocent Kashmiris are brought to justice. Foreign Minister Qureshi said that the rampant use of pellet guns had destroyed the lives of several thousand Kashmiris ,blinding and mutilating them , taking away their eyesights and livelihood. He added that India considered this to be a “Non-lethal weapon”. The Minister said and who can forget the case of eight (8) years old Asifa Bano of Kathua, who was abducted , repeatedly gang raped , and ultimately killed in IOK. He said this was the tip of iceberg, it was hard to imagine the true quantum of the atrocities being committed by India in IOK . The Foreign Minister said and yet,justice has been elusive all these years , as the Indian army has continued to exercise barbarism under the umbrella of impunity afforded by the Armed Forces Special Power Act. This draconian law calls for investigation, only if allowed by the government. Shah Mehmood Qureshi said that to date , not a single conviction for any crime perpetrated by the armed forces in Indian occupied Kashmir had been taken place. He further said that the deteriorating situation in Indian occupied Jammu and Kashmir has made it all the more necessary to establish an independent, impartial and international investigation to assess the situation in Indian occupied Jammu and Kashmir. Pakistan, he said has repeatedly called for an unbiased investigation into the gross human rights violations in IOK. This, he said was consistent with the Reports of the United Nations Oddice of the High Commissioner for Human Rights which confirms the atrocities and calls for the formation of a commission of Inquiry (COI)to investigate human rights abuses. The foreign Minister also mentioned reports of All-Party Parliamentary Kashmir Group (APPKG) about gross human rights violations and atrocities by the Indian occupations forces against helpless people of IOK. He said that 11,111 gang raped,or molested ,108,000 children orphaned and 109,000 structures arson ed and gutted in IOK. He told the participants “I wish to draw your attention towards the unrelenting atrocities,oppression and torture being faced by the Kashmiri women”. He said that an entire generation is growing up ,traumatized under the dark shadow of targeted attacks sexual violence and forced disappearences. Shah Mehmood Qureshi said that Kashmiris in Indian occupied Jammu and Kashmir are being brutally and systemically murdered,maimed and reped for the simple crime of demanding their right of self determination. He said brutal crackdowns ,curfews,detentions, massacres, target killings,sieges,burn downs, torture disappearance,repes,molestations, and fake encounters had not extinguished the flame of freedom ,only fuelled it further, he remarked. The Foreign Minister said that in three decades of the latest uprising ,conservative estimates put 100,000 martyred,145,000 arrested and 23,000 women widowed in IOK. He said that there was no freedom of speech and expression in Indian occupied Kashmir. He said that India must be held accountable for committing crimes against humanity in IOK. He demanded the international community to imposed sanctions and boycott of making trade and investments with India for committing crimes against humanity in Indian occupied Kashmir. The other speakers called upon India to stop gross violation of human rights in IOK and implement UN Security Council resolutions on Kashmir.